Connor, born prematurely at 34 weeks’ gestation, spent 7 days in the Intensive Care Nursery at DHMC. The collaborative will collectively study the evolution and biology of human pregnancy, how progesterone impacts pregnancy maintenance and preterm birth (defined as birth before 37 weeks’ gestation), the sociobiology of racial disparities in preterm birth, and the genetics of unique human populations. The Dartmouth team, led by professor Scott Williams and colleagues Jason Moore and Christopher Amos, is examining diverse world populations that have higher and lower levels of premature birth. 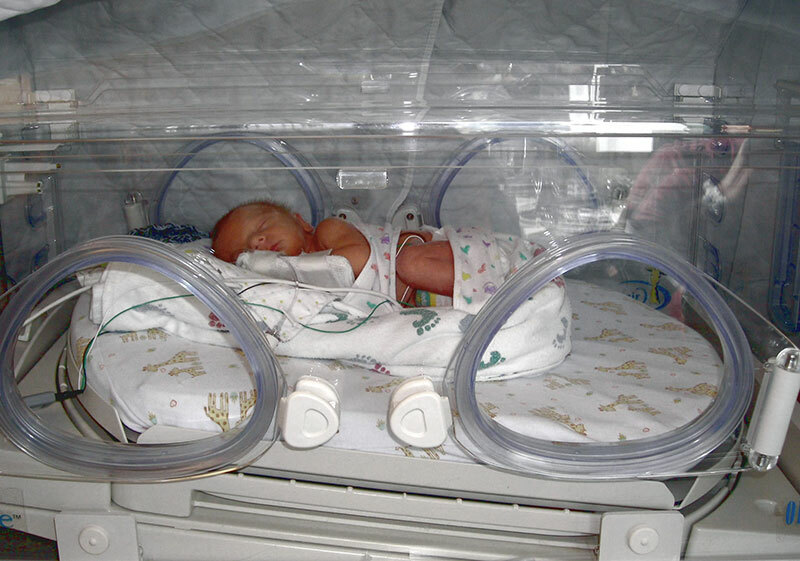 Premature birth is the leading cause of newborn death and disease. In New Hampshire and Vermont, one of every 17 babies is born prematurely, or more than 1,000 babies per year in the region. Researchers don’t know why preterm birth happens in roughly 10% of pregnancies in Caucasian women nationwide, but in about 20% of pregnancies of African-American women. They also don’t understand why recently there has been a large increase in preterm birth rates, especially at 34-36 weeks, according to Dr. Williams. “This creates enormous health care costs, because much of childhood disease is due to short gestational age,” he says. Babies who survive a premature birth may suffer “permanent vision and breathing problems, cerebral palsy, and learning disabilities,” according to the March of Dimes. In this large, collaborative effort, researchers with diverse backgrounds will exchange information and “create hypotheses to identify the many underlying causes of preterm birth, and translate new knowledge into new approaches to the prevention of premature birth.” The collaborative includes medical schools and hospitals at Case Western Reserve University, Dartmouth College, Ohio State University, the University of Cincinnati, the University of Iowa, Vanderbilt University, and Washington University. The grant was developed in close consultation with March of Dimes leadership, who sought good science and “out of the box” ideas, Dr. Williams says. “They asked, ‘can we generate research teams that can take the research in new directions that may have a high payoff? '” Dr. Williams and colleagues aim to investigate new ways to filter and re-analyze genetic data to provide novel information and findings that were previously “tossed out” or missed. Dr. Williams has studied the role that genetics plays in preterm birth and disparities among populations for almost ten years, and has shown that there may be population-specific risks. In the current program, his efforts will refocus on using the known differences in preterm birth rates across populations to help define genetic risks that might otherwise be missed with standard analytical approaches. This approach explicitly incorporates evolutionary processes that may have been critical in causing these prevalence differences.